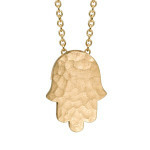 With its old-world finish and dainty proportions, our hammered hamsa necklace can be dressed up or down. Handcrafted in 14k yellow gold and strung on a 16″ cable chain. The hamsa charm measures a delicate half inch from top to bottom. Also available in white gold, gold plate and sterling silver.